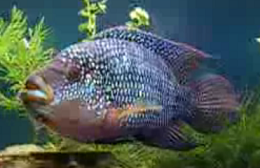 Jack Dempsey is a territorial type of cichlids, which can easily devour all your smaller fish. They are not the kind of community fish, which can get along with other tank mates and selection of different fish to live with them should be done carefully. In fact, this is only possible provided that there are enough rooms for the fish to establish its own territory and the tank mates is large enough to defend against any vicious attack. Often selection of tank mates are done by just trying your luck with careful observation along the way and so far, known compatible species to put and mix with your jack dempsey can either be oscar, firemouth and severum. Looking after your newly purchased aquarium pet is very much similar just like any other cichlids care and tank setup with water temperature matching the requirement of a tropical species while the best pH should in the range of between 7.2 to 7.8. An adult jack dempsey can grow up to 10 - 12 inches in length and being a carnivorous fish, they require constant feeding of meaty meal such as shrimp and feeder fish. Because of this requirement, the water gets dirty easily which is why a good aquarium filtration system is definitely needed combined with presence of a bristlenose catfish, not to mention regular water changes as well. The minimum tank size for a single jack dempsey fish should be at least 30 gallons and if you have intention to house a pair of male and female fish, you would need 60 gallons and above large tank. Jack dempsey is usually mature by time they are 6- 8 months old and it’s quite difficult to tell apart between the male and female fish. Sometimes even an expert hobbyist can give wrong information and until both fish start to pair up and lay eggs, there’s no surefire or reliable method to use as a guide. Breeding your pet should be relatively easy because just like any other cichlids fish, the parents will protect and care for the young until they are large enough to be able to fend for themselves. Breeding jack dempsey is a rewarding business because a single pair could produce up to 80 or even more offspring and there’s a huge demand for them for sale in pet shops. A variation of the fish species known as electric blue jack dempsey is widely sold in aquarium trade and highly sought after because of their bright and unique coloration. However, the fish is known to be short-lived because the genetic makeup resulted from cross-breeding has so far produced a species that is weak, vulnerable to common aquarium disease and they usually die before reaching maturity age. Although nobody exactly knows which species were crossbred with to come up with the species variation, I wouldn’t recommend buying these fish because obviously it will be a waste of money, time and effort.